Hoher Kranzberg: Fantastic Views from a Little Mountain! Snow is not usually difficult to find especially in February…in the German Alps…but in 2014? It’s proved not so easy. The Twitter Gods, or in this case, John Jenkins responded. And because of his tweet, off we (my husband and I) went to Hoher Kranzberg in Mittenwald. It’s located just south of the more famous Garmisch-Partenkirchen, home to my favorite hike in Germany and the Partnachklamm, another easy, yet gorgeous hike through a gorge.. It’s a little over 100 km from Munich. The hike starts at the Kranzberg Sesselift (Chair lift) in Mittenwald. Here, you have the option of either going directly to the Hoher Kranzberg (High Kranz Mountain), or ascending via the Lautersee (Lauter Lake). We ascended directly to the Hoher Kranzberg which takes about an hour. This route is more direct, steep in places and follows a road all the way up. It’s nice, but the Lautersee route, the way we returned, is much nicer. It’s also a more gradual route, and most of the path is through a forested hiking trail, which I prefer to hiking on a road. I highly recommend going the Lautersee route either on your ascend or descent. There’s also a hut where we enjoyed a lakeside lunch. Near the hut, is a Forest Discovery Path for children. From the Kranzberg Sessellift, the Lautersee is only a 30 minute walk and not very steep, so if you were looking for just a short walk this is also an option. The start of the hike near the Kranzberg Sessellift (Chairlift). Overlooking Mittenwald, view from the summit of Hoher Kranzberg, with “theatre style” seating to enjoy the view! Me relaxing at the Panarama Kino. How’s that for a reward? Mountains and Mittenwald! 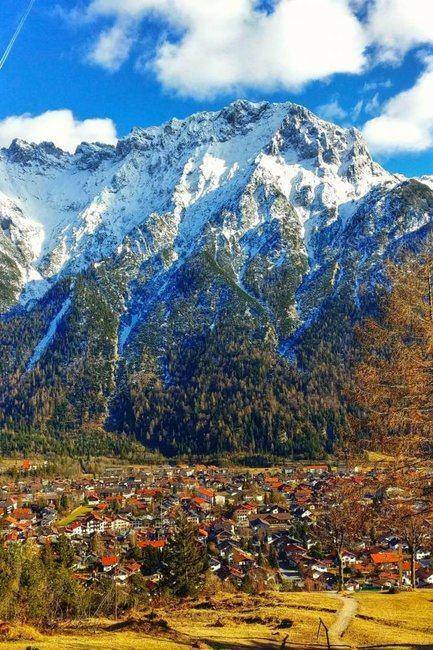 A gorgeous town lying in the valley of the Alps! We didn’t need our snowshoes, but at least we did find snow above Mittenwald, but alas my zero snowshoeing this season record still holds. Is there still enough of winter left to turn this travesty around? Lets hope so! Length: 13km if you go the scenic route past two lakes (optional), shorter if you just go to the Lautersee, or directly to Hoher Kranzberg there and back. I recommend taking the loop trail and hitting at least one of the lakes en route. Difficulty: Easy as long as you’re in decent shape. Navigation: Easy, the path is well-marked and signed. Landscape: Beautiful! The views far outweigh the effort involved in this hike. Getting there: The hike starts at the Parkplatz Hoher Kranzberg (Kranzbergstr 34, Mittenwald). We drove there but you can also take the train which takes 1:51. Train Travel Tip: The Bayern ticket is the cheapest way to get there (a 1 day ticket good for anywhere in Bavaria for up to 5 people). It can be purchased directly from the machines at the Hauptbahnhof or at the DB ticket counter. The train station in Mittenwald is 900m (~10 minute walk) to the Parkplatz Hoher Kranzberg. Further details of the hike can be found here. It’s in German, but Google Translate can help with that. That summit looks awesome! It has been an unseasonably warm winter, and finally our Dolomites are looking like they actually have some decent snow on them too. @Jennifer - Agreed, didn't realize there wasn't much snow in the Dolomites either. It's been such a strange year. For some reason I never went hiking in Bavaria yet, although I thought about it several times although I have to admit that I wasn't thinking about a winter hike but now after seeing this, wow, I would love to do a winter hike there. The area looks so gorgeous, stunning photos as well. Do you recommend it in the summer? We are also deciding on which gorge to hike. Leutasch, Partnach, Hell Valley? If we can't make it to Hell Valley - what do you think about the other two? Thanks. LOVE your site. @Dianne - I've only done it in winter, but there are two nice lakes along the way, one I know for sure is good for swimming. Hell Valley is definitely my favorite, but you can't go wrong with Leutasch or Partnach, both of them are lovely as well. @April - Kids can definitely do it. It's steep in a few places, but there's no technical difficulty. It's ~450m of elevation gain. Summer is best if the kids want to swim in the lakes, but for snow it depends on the year, but generally speaking, there should be snow from December through to March. Enjog. Many beautiful places. There are so many more beautiful places. You can visit Nepal in asia . Have provided information on our site. Wow, that view though!!! Incredible. it looks beautiful! Im not normally a snow seeker but who could resist a view like this! @Laura - The weather was quite warm so that helped too!